Along with being named among downtown Chicago’s most luxurious apartment buildings, 850 N. Lake Shore Drive is unique in that it is both historic and modern all at the same time. As a prestigious and historic beaux-arts building that was originally built back in 1929, charming, elegant, and sophisticated are just a few ways to describe this one-of-a-kind address, but the list certainly doesn’t stop there. 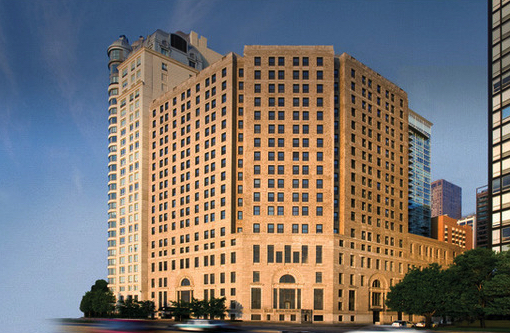 When first completed, 850 N. Lake Shore Drive was originally an upscale athletic club that also featured apartment residents, but back in the 1970s, Northwestern University acquired the building and transformed into a dormitory for its downtown Chicago campus. It remained a dorm all the way up until 2005 when it was then sold and finally turned into a collection of ultra luxurious apartment residents, which debuted back in late 2013. Check out 850 N. Lake Shore rentals or continue reading more about the building below. 850 N. Lake Shore Drive is comprised of studio apartments, convertible apartments, one-bedroom apartments, two-bedroom apartments, and three-bedroom apartments. In all, 9 different floor plans were offered when 850 N. Lake Shore Drive was re-developed, giving future residents plenty of options and opportunities to call this amazing building home. Some of the floor plans here are rather unique thanks to the building’s angular footprint, but most still offer terrific views of the lake and surrounding cityscape. 850 N. Lake Shore Drive is also equipped with plenty of building amenities as well, which include an indoor saltwater swimming pool and whirlpool, a landscaped rooftop deck with gas grills, a state of the art fitness center, and an awesome elevated dog run that’s great for all you pet owners. DIDN'T SEE ANYTHING YOU LIKE AT 850 N. LAKE SHORE? If you're finished browsing apartments for rent at 850 N. Lake Shore, start searching other luxury rentals in Chicago or contact The Guarnero Group at 844-SEE-CHICAGO for help with your Chicago home search!